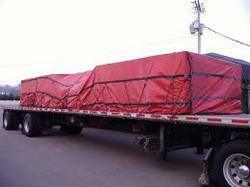 We are the reputed manufacturer and supplier of an extensive array of Truck Tarps. Manufactured using the finest quality raw material in line with industry standards by our vendors, this tarpaulin is extensively used in warehouses and to cover trucks. This tarpaulin is available with us in different lengths and thicknesses as per the needs of clients at in industry leading price. Ruchi Traders, one of the leading manufacturers traders and suppliers of this impeccable range of HDPE Laminated Fabric & Fumigation Cover, incepted its operations in the year 2012. The offered range comprises the finest Industrial Tarpaulin, Outdoor Tent and Vehicle Cover, which have a high preference in the market. Its manufacturing involves in utilization of quality materials and advanced machines, as per the norms and guidelines of the industry. This ensures the product’s finishing, tearing strength, elegance and resistance to heat and moisture. In addition to this, the range is marked at the best rate possible. The highly advanced state-of-the-art infrastructural facility at Ruchi Traders, has been laced with all the machinery and equipment, needed for the facilitation of the achieving of several of the firm’s predefined goals and objectives. We keep up-grading the facility on a highly regular basis, for reasons of maintaining our position in the market and maximizing our production capacity. In order to attain smoother and efficient management of the firm’s operations, the facility has been parted into a number of highly operational units. In addition to this, we have managed to attain a huge client base, owing to our ethical working habits.